Research institutions have or are planning to build, expand and renovate animal research facilities to keep up with the demands of biomedical research caused in part by growth in the use of genetically altered rodents and the upsurge of research in infectious diseases. Properly designed facilities greatly facilitate effective management and high-quality day-to-day animal care that is required to optimally support animal research and testing. There are multiple solutions to address the myriad of factors that influence the design and construction of animal research facilities. There is no “best” design applicable for all facilities and arguably not even a single “best” design for a given facility. 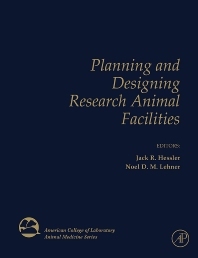 For this reason, Planning and Designing Research Animal Facilities is not intended to be a “how to” book. The goal is to cover the basic programmatic requirements of animal research facilities, provide ideas for meeting those requirements while, hopefully, stimulating the creative process in which designers in consultation with those who work in animal research facilities generate even better ideas. That is how progress has been made and will continue to be made.